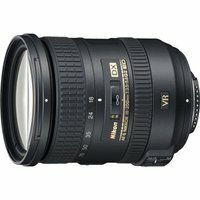 The Nikkor AF-S DX 18-200mm F3.5-5.6G ED VR II lens from Nikon is a flexible 11.1x Vibration Reduction 'superzoom' and replaces the popular AF-S DX VR Zoom Nikkor 18-200mm F/3.5-5.6G IF-ED. This lens offers improved functionality and image quality as well as an 11.1x zoom and a new zoom lock switch. In addition the Nikkor AF-S DX 18-200mm F3.5-5.6G ED VR II lens includes improved Super Integrated Coating and the Vibration Reduction II system which allows you to shoot at shutter speeds up to four stops faster than would otherwise be possible.